Home » Miscellaneous » Growing and Selling Edible Plants! This is information shared in our Members Area by one of our members in Shelton, Washington, Andrea Bichsel of Hammersley Inlet Farm & Nursery. Andrea put this list together for our members. She’s in zone 8, so you might have to find varieties that are more suited if you are in a colder zone like 4, 5, or 6. As requested in another thread, here is my top twenty list for edibles that I sold this year, in roughly the order of popularity. I also added propagation notes–others please jump in with your experiences! As with everything else, prune your cuttings often for good branching, especially the fast-growing ones, because they’ll get leggy quickly. Always tell customers they are self-fertile, but they’ll get more berries if they have a different variety that blooms at the same time; sometimes you can sell 2 early, 2 mid, and 2 late season. Had 700, sold out. Propagate by cuttings in early spring if you can. If you’re in Washington, you have to get your blueberries tested in June/July or September if you plan to overwinter them and sell them to Washington residents. Fastest-growing ones I carry seem to be Pink Lemonade and Legacy, although Bluecrop fills out fast. Allow 2 seasons before selling if you can. Had 100, sold out. Division works best for me, also some success with root cuttings, layering is also good. Lots of asks for thornless varieties this year will bring in some liners of those for next year. Had 100, sold out. Propagated by SW cuttings. I ca n’t report on hardwood cuttings, because I didn’t have enough material because I sold out this year and last. Had 50, sold out, bought in another 300, sold probably 25 of those, will start pushing them again now that they look good. They grow surprisingly well here, even though they’re native to the southeast US. I have seedlings grown from select seed to increase the chance of having good fruit. You need at least two to tango. I tell my customers all this to warn them that while they have a decent chance of getting good fruit with these, it’s not guaranteed like if they bought a named cultivar. Of course, named cultivars are $60-80 and are pretty much sold out everywhere around here. Grow from select seed (don’t bother with regular seed), or buy in whips grown from select seed. Graft from a named cultivar onto the select seed whips or sell as is. Don’t even bother with cuttings. Had 50, sold out. Propagate by cuttings if you want a specific cultivar (both softwood and hardwood worked about equally well for me with Phoenix Tears). They are very easy to grow from seed, but you get the generic variety. I’ve got about 1,000 growing on right now, with another 1,000 or so on their way. They need a compatible pollenizer variety, so always sell at least two. Had 500, have maybe 100 left. Very easy to propagate with softwood or hardwood cuttings, fast-growing, overwinter well (at least in zone 8). Can have a saleable plant ready that year. They need a male and female, be sure to have both; even the self-fertile variety Issai does much better with a male. Had 100, sold out. I had better luck with softwood than hardwood cuttings but did ok with hardwood. Can do with single node, but I’d advise a little longer just to have a bigger plant earlier in the season. Had 50, sold out. This is actually quite funny here, where you have to fight off the invasive Himalayan variety each year just to see your yard. I just tell people I send my 8-year-old out to pick blackberries off of ours and he comes back unscarred, and they buy. Also, let people know they can train the long vines into a circle, so all the berries are within reach. Propagate by division, root cuttings, or layering. Had 100, have 5 left. Also very easy to propagate with softwood or hardwood cuttings, also fast-growing, can have a saleable plant ready that year. They need a different variety for pollenizing. Had 100, sold out. Propagate with softwood or hardwood cuttings. I’m trying from seed this year, no results to report yet. Had 100, sold out. Super easy to propagate from softwood or hardwood, I use a thorn stripper and mutter under my breath a lot. Saleable plant within a year. Mine have berries the second year. Had 50, have 8 left. 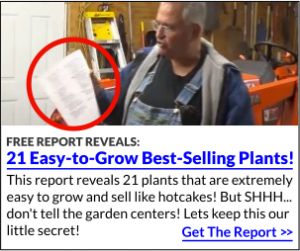 My softwood and hardwood cuttings failed, so hopefully, Neil will give his tips (inside The Backyard Growers Business Center). I’m going to have to buy in liners of these for next year. Had 300, have 30 left. 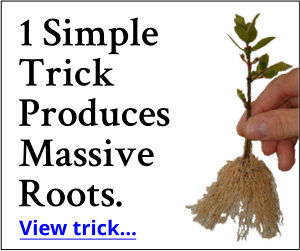 Also super easy to propagate from softwood or hardwood. Saleable plant within a year. Unlike the gooseberries (which are related), no berries the second year so far. Had 200, have 30 left. These are pretty similar in heritage. Cascades are hands-down my favorite for making jams and pies, and I tell my customers that. Also, while they were popular in the 1950s and 1960s, they’re fairly rare now. I know of only one or two other nurseries that carry them and they’re all sold out last time I looked. Loganberries and marionberries are preferred by commercial growers. Propagate by division, layering, or root cuttings. Had 300, have 200 left. Now that the grapes are going to town, they’re starting to sell like hotcakes, too. I didn’t sell very many last year, though. Propagate from hardwood cuttings–read everything Neil has written about it (inside The Backyard Growers Business Center), and be patient. My hardwood cuttings took 2-3 months to root after spring started. Had 50, have 40 left. Now that mine are just starting to bud out, people are starting to buy these, too. Grow by seed or buy in whips. You have to scarify the seed with sandpaper, then soak before sowing. Can scarify with acid, but no thanks. Sold 10-100 of each. Yep, I sell gallon pots of them at $5.97. There was what I’m calling The Great Rosemary Die-off here a couple of years ago, and I get a lot of people replacing their dead bushes. I sell Arp right now because our Arp survived over all our other rosemary plants. I propagate perennial herbs with softwood cuttings, and I just water them without putting them under mist. I haven’t tried them with hardwood cuttings, so can’t give you any data on that. I also propagate a lot from seed, most are pretty easy and the seed is cheap. Had 100, have 75 left. These grow wild all over the place here, but people want to have them in their garden. Propagate with softwood cuttings late spring. Haven’t tried hardwood cuttings. Had 50, sold out. Great shade ground cover, similar (and related) to salal. Propagate with root cuttings and division. Like salal, root cuttings give me the best-looking results. I’ll report back on growing from seed some other year. Had 50, have 25 left. Not really a cherry, but a dogwood with edible berries (fun fact: Cornus kousa berries are also edible). Haven’t tried propagating these yet, but might try both softwood and hardwood this year. Had 50, have 25 left. Not exactly an edible, but when I tell customers about making a tea or sitz bath (without saying anything about why, because FDA), they’ll often buy one. I just buy in whips, but I might try some from seed some year. Had 50, sold out. Need a male and female to produce nuts. People can make tea from the leaves. Mostly I sell it as an ornamental. I warn people that I don’t know which are male and which are female, and that the female trees can get stinky. Doesn’t deter most, though. Buy in whips or grow from seed. I sowed 500 seeds this year and the stupid squirrels got every single one. I could have sold probably hundreds of apple, cherry, plum, and pear trees if I’d had them. I will have them next year. Edibles have accounted for over half my sales this year so far. I had quite a few requests for ground cherries or cape gooseberries. I’ve got 100-200 of those growing for next year, along with about that many Chinese lanterns. They’re related, and both edible–they’re also both related to tomatillos. I’ll warn people to keep either one in a container because they are aggressive. Very easy to grow from seed, perennial in my zone. I’m trying out several more unusual edibles in future years because those seem to be a very easy sell here. Some are common elsewhere, but not here. These include mulberry, serviceberry, medlar (after reading about it, sounds like fun if I can get seeds started), jujube, yuzu (a fairly cold-hardy citrus similar to lemon and lime), Chinese chestnut, walnut (not uncommon, I just don’t have any for sale yet), hazelnut, sea buckthorn, pomegranate, and quite a few others. Some I’m propagating by seed, some I’ll buy in as whips. I’m super excited about the yuzu seeds I got and hope I can grow those on and overwinter successfully. Some of the items I listed might not be hardy to your zone, so do your research before trying them. Haskaps, some hardy kiwis, some blueberries, possibly aronia, and probably some other berries require a certain amount of chilling hours to break dormancy properly and produce berries. Be sure to research those requirements for your zone, too. So far, the zone I’m in is great for a wide variety of berries. If you’re in zone 9 or 10, for example, you might want to get southern highbush or rabbit-eye blueberries. Where I am, I can do those or the northern highbush varieties. I have been using old carpet and rug pieces for weed control. It seems to work well, but needs slight adjusting monthly so that it doesn’t adhere to the ground allowing weeds to come through. I don’t need to use as much mulch this way. What do you think? Question; are people using paraffin wax for weed control? I was looking at a strawberry farm online and it looked like thick ice, but it couldn’t have been. I suppose carpeting is okay but in a closed environment it will mold and become toxic to humans. Never heard of wax. For zones 8 – 3, consider Jerusalem Artichokes, AKA Sunchokes. They are a native perennial, actually fairly common in several areas in the east. I know of at least 5 different varieties around here (west-central PA.). I have three varieties growing on my 1 1/2 in-town lot. We can most of ours. Plain like potatoes and as pickles and relish. We prefer them to cukes. They are persistent, hard to get rid of and love to spread. They demand their own private garden. I have Stampede, a white/tan knobby tuber under a 5′ -6′ top. Red Fescue, very much like the Stampede but red and about a foot taller. Fuseau, a white/tan carrot shaped and sized toot under a top that can reach up to 10′ tall. Oops, did I write ‘toot’? I sure did! Sunchokes are packed full of a soluble starch called Inulin. For folks with unhealthy, unbalanced gut bacteria, they earn their other nickname; Fartichokes! Extended cooking, freezing for several hours, fermenting like sauerkraut or boiling in an acid such as lemon juice converts the Inulin to fructose and eliminates the gas issue. On a 1 1/2 lot we don’t grow them to sell. We use most all we grow for ourselves. Thank you FB Clark, great information. I use two to three layers of regular newspaper in the garden, then plant through a hole in the paper. It will last for a month, maybe two since earthworms thing it is candy. I usually mulch between the rows in the summer with grass clippings and shredded paper. Once again, the worms eat the paper and grass, but the shade keeps the weed seeds from sprouting. I save the compost for making potting soil. Have you considered selling sweet bay plants? Tell us more about this plant. I have Japanese stilt grass in my natural area. How can I get rid of it? If I plant pachysandra, will it over ride the stilt grass? I’m not familiar with silt grass but I’d get rid of it before I plant something else in the area. Can tar paper be used for weed control around vegetable plants? I don’t think it would be recommended, there are some pretty heavy chemicals in tar paper. You can use several layers of brown construction paper that comes in a roll or newspaper. You could use tar paper but like other person said it might not be the best thing. There are landscape fabrics that last a long time if covered they are a tad more expensive but paper type will need replaced over time.